Probably the most desirable football game ever made. 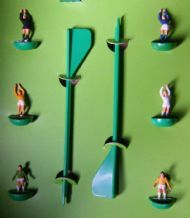 A monstrous feast of Subbuteo items created for the 1974 world cup. Strange 'World Series' name for the game - has to be aimed at the USA market? 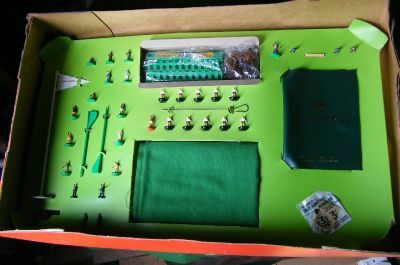 Unbelievably this is not the largest Subbuteo set ever made. The Stadium Edition contained 3 layers and even more bits and pieces. 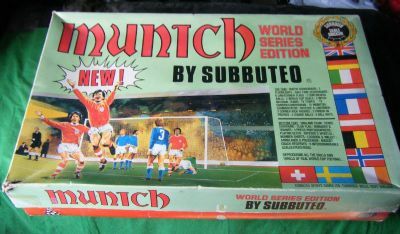 Everyone who loves football should own a Subbuteo Munich set at some point in their life! Huge 1970s football game packed with everything you could ever need Subbuteo wise! Floodlights, scoreboard, 2 teams, goals, 5 footballs, ref and linesmen, corner kickers, throw in takers, 6 flags, 6 ballboys TV tower and half time scores fence!! Pitch, fence, another team, log book, number stickers, policemend, ambulance men and stretcher, whistle, a flag, 6 spare goalies(! 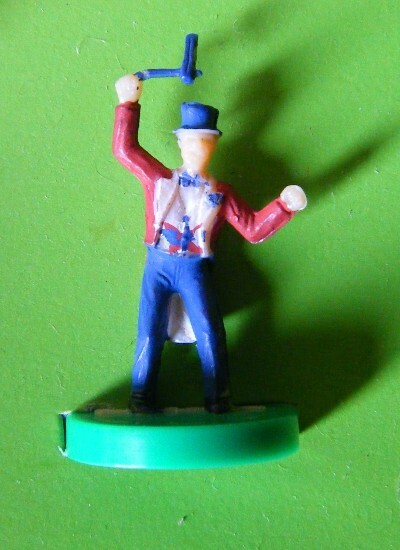 ), managers, trainers, substitutes bench and a Ken Bailey mascot figure. No need to worry about a loss of form with so many squad goalies as cover. Three large size corner kickers painted in the same colours as the teams. England, Germany, Holland.